How Do Gravitational Waves Really Work? : 13.7: Cosmos And Culture Gravitational waves — ripples in the fabric of space-time — are a big deal in the world of science. Here's a video that helps explain how they work. How Do Gravitational Waves Really Work? 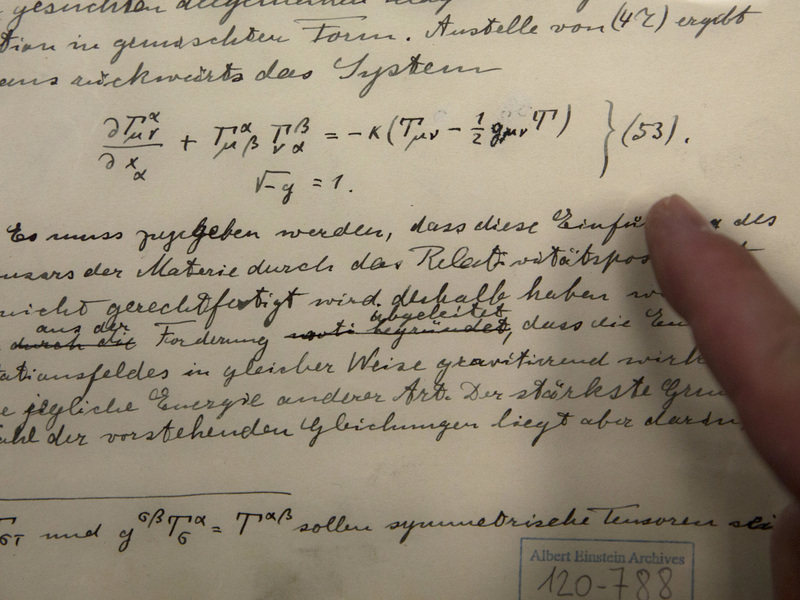 The original historical documents related to Albert Einstein's prediction of the existence of gravitational waves are seen at the Hebrew University in Jerusalem on Feb. 11, 2016. A couple weeks ago, astronomers announced they had detected gravitational waves from a "kilonova" (I hate that name but we'll wait for another blog post to explain why). A few weeks before that, the Nobel Prize was awarded for the work that went into LIGO, the gravitational wave observatory. So gravitational waves — ripples in the fabric of space-time — are a big deal in the world of science. But how, exactly, do they work — and how, exactly, can you learn about them in under four minutes? Thanks to folks at Minute Physics and The Kids Should See This you can now get the answers you crave so desperately — just watch this video.